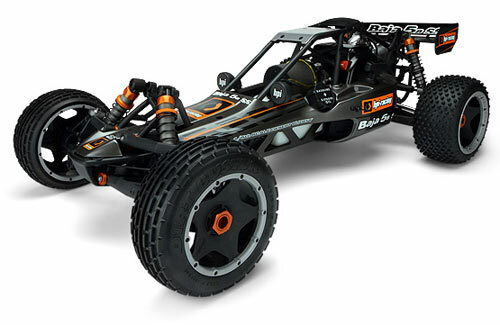 All Products > "112457 HPI Racing Baja 5B SS Kit 1/5 2WD Petrol Buggy"
The breathtaking Baja 5B SS - Large Scale Power - Tougher Than Ever! 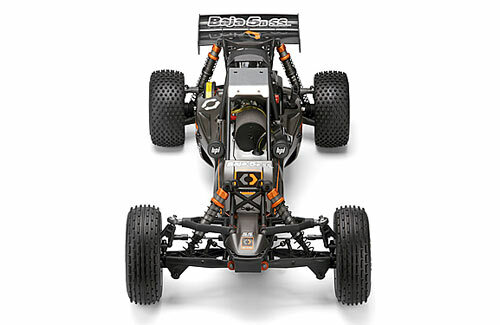 The 1/5th scale Baja 5B RWD desert racing buggy has been a huge success with RC fans, racers and journalists, and Baja owners have been extremely happy with the racing prowess, durability and qualities of the Baja 5B buggy. Now, HPI is proud to announce that the Baja SS, the full-option Baja kit that you assemble yourself, is not only loaded with tons of hop-ups that enhance the speed and power of the Baja; now HPI have improved its durability even further! 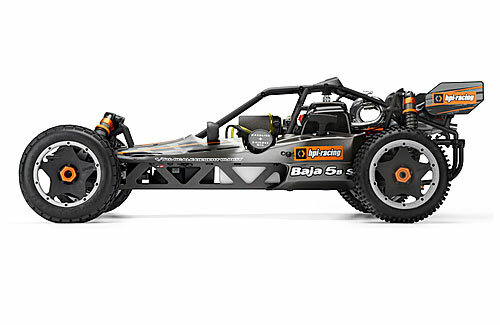 The Baja SS is an epic member of HPI's range of upgraded �Super Sport' models that feature kit versions of HPI's popular RTR models, with additional option parts added to enhance the enjoyment of your kit. 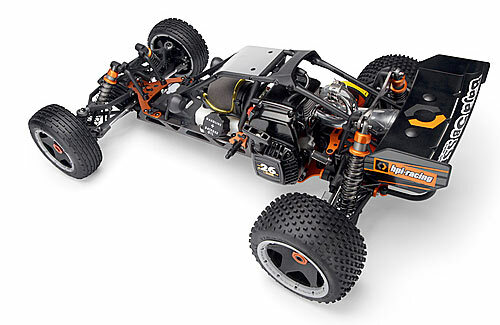 A long list of option parts is included with the SS version of the Baja 5B. As you build the kit, you add in the options that come in the box, and add your own radio gear (receiver, throttle servo, and receiver battery). To handle the extra horsepower of the Fuelie 26S, the drivetrain of the Baja SS is boosted with specially designed option parts that can handle the power increase. Providing a boost of extra power is the #86690 Aluminium Tuned Pipe - now complete with #87288 steel header for even more durability - is designed just for the 26cc engine and gives even more acceleration power to the Baja SS. The #15448 8000 RPM Clutch lets the engine rev up to a high RPM before engaging the drivetrain, giving you lightning-fast acceleration off the starting line and out of every corner. Protecting the differential is the #87568 Aluminium Alloy Diff Case, giving protection from the extreme strength of the engine. When it comes to transferring all this power into breathtaking action on the ground, the #104966 Super Heavy Duty Dogbones get the power from the diff to the rear wheels with chunky steel driveshafts and jointed rubber boots for minimal loss of power. Add the #112845 Heavy Duty front hubs and the #104781 One piece rear uprights and we have one tough unit ready to blast deserts, rugged wasteland and anything in it's path with unshakeable durability. At the heart of the Baja SS is the #15403 Fuelie 26S 26cc engine, a tougher, stronger and more powerful engine than the standard 23cc Fuelie engine in the Baja 5B RTR buggy. With more displacement you get increased low-end grunt, more acceleration and huge top-end speed! The Fuelie 26S is a 2-stroke engine powered by regular pump gasoline (petrol) that is mixed with 2-stroke engine oil, so the running cost of the engine is extremely low when compared to any normal nitromethane-powered glow engine. You'll spend just pennies per tank on fuel! To keep in sync with the Super Heavy Duty drivetrain, the Baja 5B SS also comes with #112845 Heavy Duty front wheel hubs. These new axles utilize a screw and nut design that eliminates the older e-clip design, which further improves the reliability of the truck. Every bit of this kit screams 'Come and get it!' ...and as Baja drivers all over the world continue to tear their Bajas through increasingly gnarly terrains - HPI's designers keep boosting the kit's rugged durability to keep the Baja coming back for more.